The Short Version: Dr. Seth Meyers is a clinical psychologist sought after for his expertise in relationships, parenting, and youth. Trained to analyze emotional issues, Dr. Seth runs individual and couples therapy sessions in Los Angeles to help his clients get to the heart of their problems. 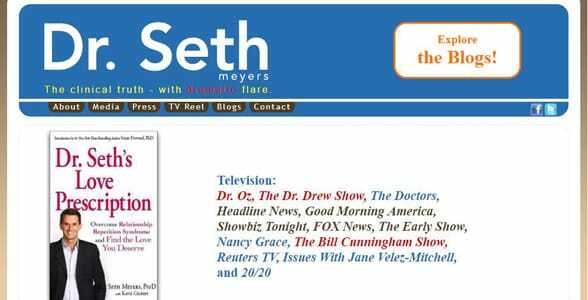 Over the years, Dr. Seth has also shared his professional opinions on television segments for shows like “Dr. Oz” and “Nancy Grace.” Today, as an author, blogger, and television guest expert, Dr. Seth explains the nuances of relationships, dating, parenting, and other important topics to a national audience on a variety of platforms. Singles and couples can read Dr. Seth’s book or his blog on Psychology Today to learn how to break negative dating patterns and date in a healthier and happier way. As a teenager, Seth Meyers had a clear idea of what he wanted to do with his life. “I knew from the age of 16 years old that I was going to be a psychologist,” he said. He went to Vassar College and majored in psychology, and then he went to New York City to get his doctorate in clinical psychology. Over the years, he completed training in hospitals all along the East Coast, helping people recover from traumatic events and start rebuilding their lives. He spent a one-year fellowship working in an addiction treatment center on Skid Row in LA. Dr. Seth Meyers is a clinical psychologist, author, blogger, and TV guest expert. In private sessions, Dr. Seth worked with singles and couples who faced emotional obstacles in their lives. Soon the psychologist decided to grow his audience and help more people by writing a book about relationships. His first book, “Overcome Relationship Repetition Syndrome and Find the Love You Deserve,” went on to sell over 10,000 copies. 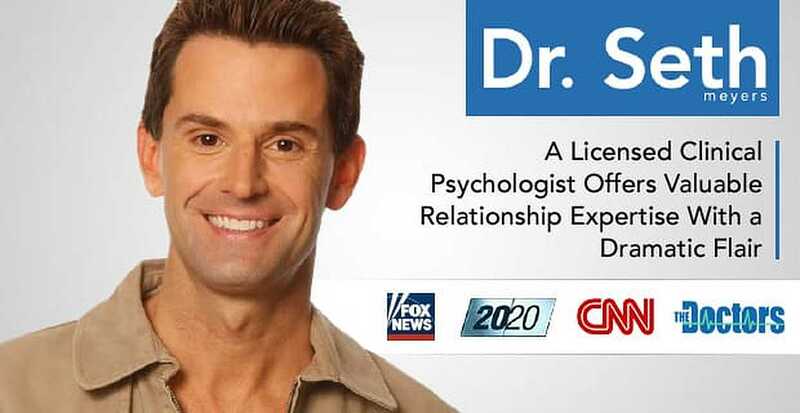 After honing his psychological perspective on national television, Dr. Seth now runs a private practice as a licensed clinical psychologist and shares his dating advice through blog posts. Over the years, Dr. Seth has cultivated a national reputation as a relationship and parenting expert. In his private practice, Dr. Seth told us he sees a lot of professional adults who don’t have significant mental disorders but seek help regarding relationship problems or self-esteem issues. Currently, the clinical psychologist specializes in couples therapy, school threat assessment, and parenting. His light demeanor puts men and women at ease as he shares his professional opinions. You can also find Dr. Seth’s tips in his relationship and parenting blog. In thoughtful blog posts, he discusses salient dating topics, including self-confidence, neediness, and attraction. His writing combines psychological principles with concrete solutions so readers gain a full understanding of how to address particular dating and relationship obstacles. From a young age, Dr. Seth Meyers took an interest in psychology and started a journey to help people deal with emotional issues. Today, he has a national reputation as a clinical psychologist who calls it like he sees it. Whether he’s advising a couple about relationship anxiety or talking to a television audience about Angelina Jolie’s weight loss, Dr. Seth gives a thoughtful analysis of what’s really going on beneath the surface. In addition to his blog, private practice, and television appearances, the trained psychologist continually looks for ways to reach out to singles and couples everywhere. In the next year, Dr. Seth is looking to scale up his trainings and workshops to give his clients more hands-on guidance on personal issues. He’s also starting to work on his next self-help book, which will focus on parenting.